Just because you're not a born writer doesn't mean you should settle for less than perfect business documents. After all, every piece you write reflects directly on the quality of the product or service your business offers. 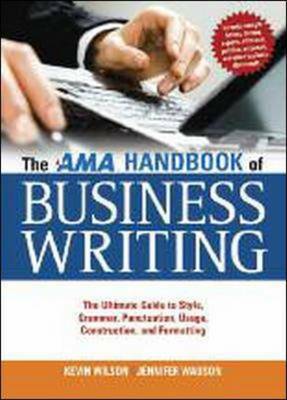 Now, this helpful guide takes the guesswork out of more than 50 commonly used business documents, including: Reports Proposals; Business plans; Presentations; Press releases; Memos; Email Newsletters; Collection letters; and, Sales materials. Arranged alphabetically and cross-referenced for easier use, the book presents clear examples of how to (and how not to) create winning materials every time. The authors' step-by-step instructions begin with an overview of the writing process, from preparation and research right through to final review and publication. Sample documents show you how your pieces should look and read, and close to 300 individual entries cover key points of grammar, style and spelling, and present strategies for writing more clearly, avoiding bias, eliminating cliches, and much more.